What are your chances of dying on your next flight, being called for jury duty, or winning the lottery? We all encounter probability problems in our everyday lives. In this collection of twenty-one puzzles, Paul Nahin challenges us to think creatively about the laws of probability as they apply in playful, sometimes deceptive, ways to a fascinating array of speculative situations. Games of Russian roulette, problems involving the accumulation of insects on flypaper, and strategies for determining the odds of the underdog winning the World Series all reveal intriguing dimensions to the workings of probability. 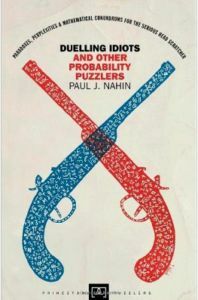 Over the years, Nahin, a veteran writer and teacher of the subject, has collected these and other favorite puzzles designed to instruct and entertain math enthusiasts of all backgrounds.If idiots A and B alternately take aim at each other with a six-shot revolver containing one bullet, what is the probability idiot A will win? What are the chances it will snow on your birthday in any given year? How can researchers use coin flipping and the laws of probability to obtain honest answers to embarrassing survey questions? The solutions are presented here in detail, and many contain a profound element of surprise. And some puzzles are beautiful illustrations of basic mathematical concepts: "The Blind Spider and the Fly," for example, is a clever variation of a "random walk" problem, and "Duelling Idiots" and "The Underdog and the World Series" are straightforward introductions to binomial distributions.Written in an informal way and containing a plethora of interesting historical material, Duelling Idiots is ideal for those who are fascinated by mathematics and the role it plays in everyday life and in our imaginations.